Good presentations are so important to Garr Reynolds that he even named his blog "Presentation Zen" and devoted it to discussing the subject. 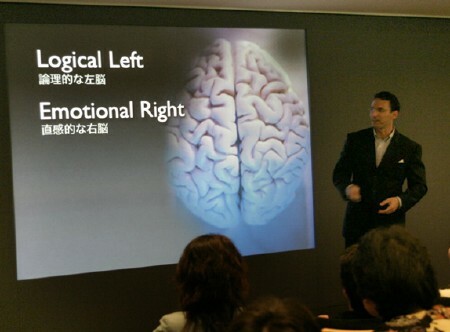 An ex-Apple employee who was Manager of Worldwide User Group Relations during his tenure there, Mr. Reynolds now lives in Japan, where he's an associate professor of management at a private university. He teaches marketing and multimedia presentations both in his classes and anywhere else he gets an opportunity, including the meetings of Design Matters, the user group he founded in Japan. Mr. Reynolds, of course, prefers to use Macs and Keynote to evangelize what he hopes what will become a counter-force to the issue of poorly designed and delivered presentations in his adopted country. As he recently explained to The Mac Observer, the problem is deeply ingrained in Japan's culture, but he's making strides. Q: Why is the state of presentations in Japan so bad? A: Some of it is culture and tradition, although things are changing slowly. After elementary school, the teaching method traditionally has been very lecture-based and didactic. Teacher lectures, students listen, take notes, and rarely ask questions. In college professors often will read from notes and make little attempt to be provocative, to inspire, to excite, or to integrate the new knowledge with what the students already know. Students are quite accustomed to this and are quite good at absorbing information and then repeating that information in tests. High school and college students are used to boring, dull, lectures. They then become company people and give presentations without much expectation that the audience will or should participate. Audiences, large and small, are viewed more as sponges for absorbing information. Yes, there is Q&A, but often it is a kind of "tatemae," or superficial Q&A. Participants may ask a question because they think they should. But a question for question's sake does not lead to good discussion. The increased use of PowerPoint has made things worse. Typically, people cram a great deal of content in each slide frame, data that would be better in the takeaway handout. The slide serves as the speaker's notes and an ineffective visual for the audience. Many presentations in Japan take place in small board rooms. It is not unusual for a presenter to be behind the projector running his computer, lights off, all eyes fixed on the screen as the presenter, who is out of sight, narrates an overly complicated chart lifted from his Word document, or reads the bullet points off the screen. Research tells us that we understand human speech better when we can actually see the face and body movements of the presenter. But with the lights off or the presenter in the back, communication suffers. Q: What are your plans to fix that situation, and how does Keynote fit into them? A: Everywhere I go, I evangelize the idea of simple, powerful presentations that focus on the audience and embrace simplicity, clarity, and elegance in terms of organization, visual design, and delivery. I tell people about the scientific research which demonstrates that the typical PowerPoint presentation is ineffective as it is inconsistent with the way people actually listen and experience presentations and process information. I also demonstrate how a more Zen approach to presentation construction, design, and delivery can completely transform their ineffective slide narrations into powerful opportunities to connect. Zen concepts such as beginning with the end in mind, simplicity, clarity, moderation, being in the moment, and the avoidance of clutter and decoration have very concrete applications to presentation design and delivery. Keynote is no panacea. Good presentation is not about the tool, whether it's Keynote or PowerPoint. In fact, part of the problem with PowerPoint presentations today is that the whole enchilada, from organization to visuals to delivery, focuses way too much on PowerPoint itself. We need to put the focus back on the audience, our message or story, and our ability to connect and persuade, or teach, or inspire, and so forth. Having said that, Keynote, because of its simplicity and elegance, does allow people to be freer and more creative. There is not the stuff inside Keynote, for example, that leads to what Tufte calls "chart junk." People are less likely to create visual disasters and awful visuals in Keynote compared to PowerPoint, though it is certainly possible to do so. Q: What has been your progress been so far? Are you seeing a change? And, again, how does Keynote factor in? A: We are just at the beginning of trying try to turn this boat called "PowerPoint culture" around. It's going to take time. But we're starting step by step. My presentations and seminars are well received. Many people are very inspired and excited by the idea of creating engaging, visually compelling stories. However, there is also great resistance to change from the "normal way." The "normal way" is, of course, the large stack of bullet-filled slides and narration of those slides with little connection to the audience and almost no appeal to the emotional side of the human brain. 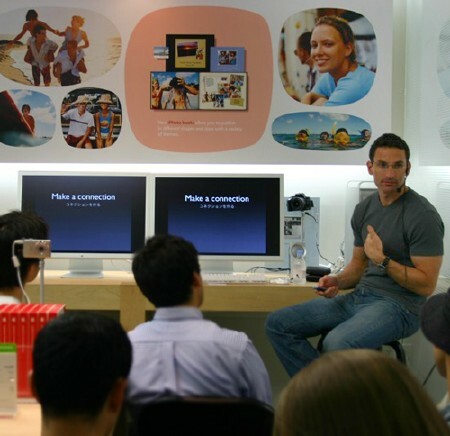 Most presentations are displays of information, information that would be better conveyed in an email or document. 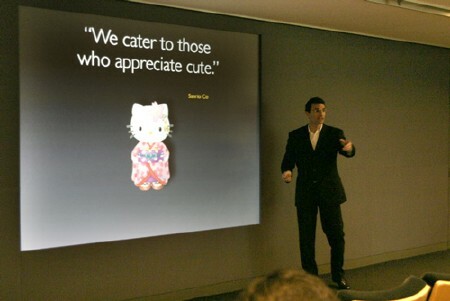 When I present at Apple Stores, the crowds are always over capacity and the response from the Japanese and foreign nationals is always very positive, though they wonder how they too can actually design such presentations. I also present to business groups in Japan -- they are always pleased and would like to make similar presentations. Is the situation getting better? Not really. In fact, it's probably worse as more and more college grads enter the workforce having newly learned PowerPoint and a host of bad habits. But many people are beginning to get fed up. It's just going to take time. A: Keynote, like the Mac, gets out of your way and allows you to just focus more on your message. The GUI of Keynote is by far superior to PowerPoint: nothing superfluous, nothing extraneous (like Zen itself), just the essentials for putting together visuals to support your talk. There are so may tools in PowerPoint, most of which you will never use, that it can be bewildering for the novice and irritating for the pro. You can get used to PowerPoint, but once you use Keynote, you'll never go back. As far as specific tools within Keynote, I'd say my favorite are: The true drop shadows, the elegant animations and transitions, and ease of adjusting the transparency of text and objects. Q: How long have you been a Mac user? A: I've been a Mac user since 1985. I use Macs because I am busy and do not have time for downtime and the mild irritations that present themselves when I use a PC. When I use a PC, I never forget that I am using a tool called a "PC." But when I work on the Mac, the OS becomes invisible. I can just work and create. Ultimately it does not matter what software or OS you use -- it is about good design, good storytelling, respecting your audience, having a clear objective, connecting with the audience, and appealing to their logical and emotional brain. But, given a choice, the Mac and Keynote are absolutely the best way to go.